The latest date added to the sesquicentennial calendar is Saturday 7th September which will see the #Killie150 Legends (working title!) night take place in the Grand Hall. The Trust and SLO are currently working on the details but it made sense to get the date out there. It’s an international weekend with no Killie fixture, and Scotland are at home on the Friday and Monday so nobody should miss out. The event will be informal, it’s not a black tie event, more a blue scarf event…although we’re drawing the line at jeans or trackies! There will be entertainment of various sorts, but in the main it will be a dance and the live band will cover music from several decades…with top chef Alasdair Hood doing a finger buffet for each table. 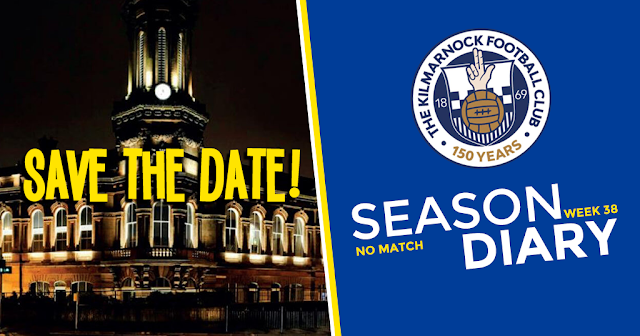 Jimmy McGuire will host and we are inviting dozens of Killie legends to come and enjoy the night as well. Ticket details will be released soon, and we will be making an effort to ensure that as many fans as possible get the chance to attend. The big news of the week appears to be the fact that we are only allocating Glasgow’s new boys the Chadwick Stand, the same stand we give to every other away team, for the last game of the season. The inevitable reaction was calls for a boycott and only to take one stand again next season, which is a bit presumptuous as they better wait and see what is on offer. Clearly they think this is all about them, when in truth of course it is not. This is a brave decision by the Kilmarnock Board to put people before profit and giving the fans what we have been asking for…home advantage at Rugby Park. We will probably not fill the three remaining stands, why would anyone think we would, but at least we are going to give it a go and hopefully a less intimidating atmosphere will bring more people to the match. Our job now is to back the Club’s decision and get as many bums on seats as possible, and that goes for the other two home games as well, not just the final one!